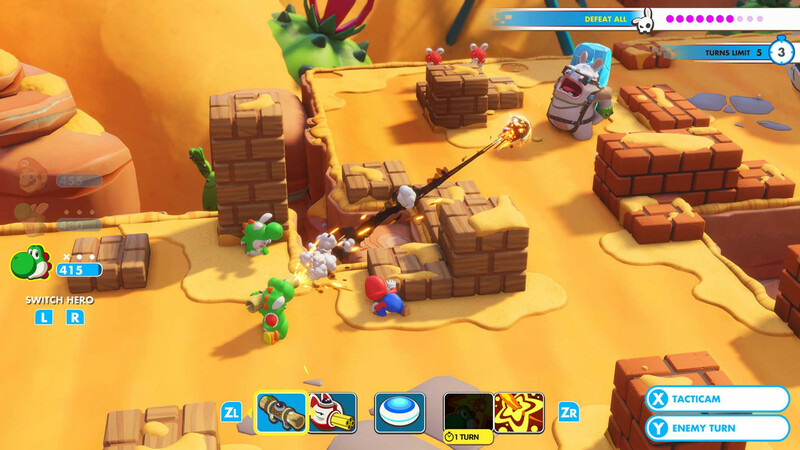 I’d love to have been a fly on the wall when Mario + Rabbids Kingdom Battle was initially pitched, as it's one of the most unlikely kid-friendly AAA titles to ever see the light of day. It's an anomaly in the best sense though: having spent four hours of solid hands-on time in its take on XCOM by way of the Mushroom Kingdom, I can confidently say Kingdom Battle is shaping up to be a dazzling title. Gameplay is a divided up into three different sections: puzzle solving, exploration, and battling. The former two intersect as you guide your party of three throughout the world, solving small puzzles and collecting coins before moving into battle areas. While each area is noticeably linear, there are plentiful rewards including weapon and ability unlocks and currency awaiting those who venture off the beaten path. While you’re locked to a party of three for the majority of Kingdom Battle, you can select which characters you want to take into each encounter. This is done through the game’s Battle HQ menu, which also allows you to buy and equip new primary and secondary weapons, upgrade each character’s skill tree, and mix and match characters to create the party you want to run with. 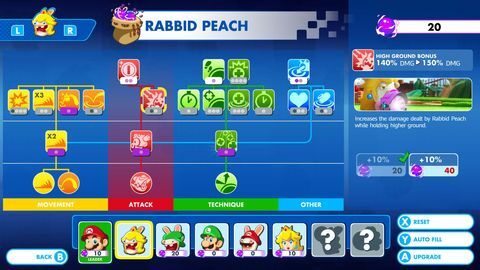 That said, it’s worth noting that Mario is required in the party and so is at least one Rabbid, so no all-Mario team is possible, unfortunately. Battling in Kingdom Battle is a tactical affair in the vein of XCOM, but there are a few elements that alter how things progress – for better and for worse. In the XCOM series, there is a sense of build up and of the unknown as you creep through a map's fog of war trying to get the drop on the enemy. By contrast, Kingdom Battle allows you to scope out an entire map and plan your moves from the beginning. However, even with a plan in place, you can be caught out by the enemy AI in an instant. Battle areas in Kingdom Battle are noticeably smaller than their XCOM counterparts, so enemies can reach you extremely quickly if you aren’t paying too much attention. Most stages also feature pipes, which allow you to flank the opposition quickly. Of course, the same can be done to you. There are different objectives to aim for in each battle. Some areas require a certain number of enemies to be cleared out before you’re able to progress, while others task you with simply making your way to an exit. While you may think the latter errand is the easier of the two, this is not the case thanks to endlessly spawning enemies. This flood of foes means you’re always pressing forward in a decisive fashion, and attempting to make it to the end zone in as few turns as possible is pivotal. Kingdom Battle doesn’t shy away from the more technical side of the genre it finds itself in, encouraging careful stat-watching and team building, and punishing errors harshly. It’s a game of cat and mouse for the most part, and after being guided through an easy opening section, the majority of us at the preview event struggled to find our feet in a late-game ghost world filled with ever-spawning Rabbids, position-changing Boos, and other tougher enemies. It’s not that the game is unfair, it was more that we didn't know enemy movements and weaknesses, or what to do in tough positions. In a game like this, hours upon hours of practice are essential, and facing the plethora of varied enemies (including a few that can only be attacked from the side or back) made our jump from tutorial to late-game war a jarring one. Most of us struggled on a level with an 'escape' objective, as we were constantly caught out by Boos, who randomly spawn across the map each turn and can teleport you far away from the goal if you run into them. It took me five attempts to figure out how to deal with them, and finally completing the level after 40 minutes of attempts had me feeling like I’d learned lessons in both tactical planning and patience. Elsewhere, I was often bounced well out of cover by an enemy at the beginning of their turn, and had to face the brunt of four or five different attacks, culminating in a death that I couldn’t recover from. It can be extremely frustrating when you have spent more than 10-15 minutes setting up a plan and playing it out almost perfectly, only for it to unravel thanks to events that feel out of your control. The game is a difficult one, and I applaud Ubisoft for choosing to make such an uncompromising game with the Mario property, but it can feel a little ludicrous at times. Perhaps this is something that will change when I’ve actually played through most of the game before being thrown into such tough battles. Kingdom Battle can be played in couch co-op, and the levels included in this mode are different to those seen in the campaign. Co-op restricts your party to two characters, but everything else is like it is in the game’s story mode, albeit played out on larger levels. This mode is a nice deviation from the game’s story, and I definitely feel like I’d get a kick out of playing it with friends at home after all is said and done on the single-player side of things. As for performance, I did encounter frame drops in both handheld and docked mode, but these didn't really detract from the experience. Rather, having something nearly as complex and deep as XCOM on the Switch is something that especially interests me, and Kingdom Battle will be excellent for longer commutes. 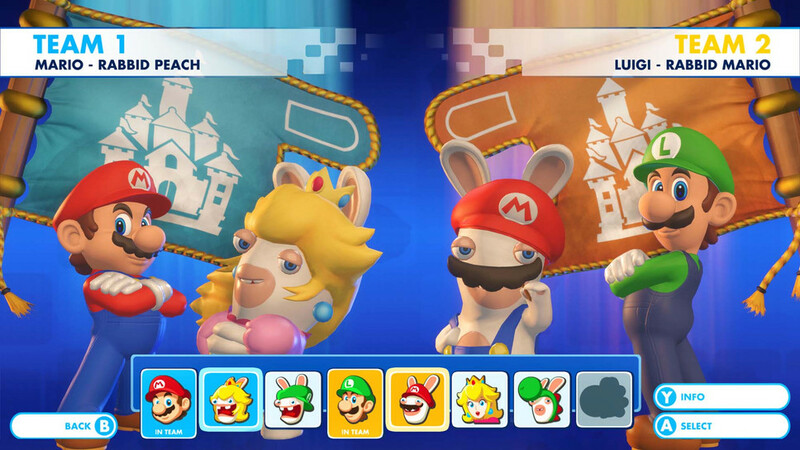 Mario + Rabbids Kingdom Battle is a madcap blending of two IPs that’s shaping up to be pretty special. Its colourful palette obscures a deep and elaborate game whose difficulty is not to be smirked at. It certainly isn’t your average Mario game, and here’s hoping it meets expectations it launches later this month.